When you think of wearable tech design, the mind immediately jumps to things like watch faces and lugs. How many buttons does it have? Is there a rotating crown? How sleek will it look on my wrist? Is the band comfortable, or even easy to replace? That's surface level. That's the design you do on a product that's already live and kicking. But how do you design for the future of wearables? At Stanford's annual Electronic Wearable Initiative (eWear for short) meeting, professors lined up to talk about their latest work to reps from the likes of Microsoft Research and Bose. 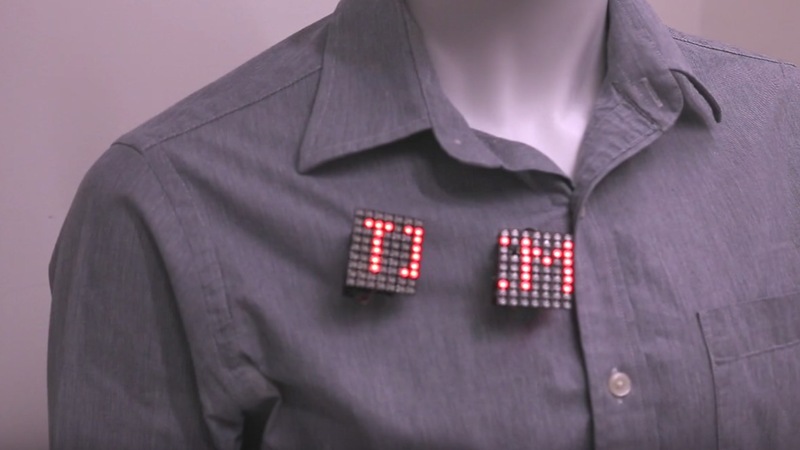 These designs range from simple things like better interfaces to help people engage with their wearables more, to entirely new wearable concepts that only the best science fiction has dreamed of. In Iron Man 3, Tony Stark's armour takes on a personality of its own. He makes a couple of gestures and it zooms onto his body, connecting itself in all manner of ways, sometimes to hilarious effect. What if your clothes could do that? That's what Stanford professor Sean Follmer's ShapeLab is working on. The team has created roving wearables – rovables – that can scoot all around your person. They're like those little parasitic fish on whales, except cute robots. These rovables would essentially move around your body to give you some fashion flair. For instance, one of them could adjust your scarf while three others form a stylish motif on your chest. They could perhaps even be installed with lights, so that you could have some illumination in the dark. Rovables aren't just good for fashion though. They can also be used as sensors for virtual reality. You'd just pop them on your body, then they'd move around until they found their place to perfectly calibrate your movements for whatever VR app you're about to use. One of the big challenges for wearable makers is longevity of use; less "sticky" wearables too often end up abandoned in a drawer. Back in 2016, Gartner pegged this abandonment rate at 29% for smartwatches and 30% for fitness trackers. Why? Because people eventually feel like they have enough data and can do everything themselves, according to James Landay, a professor of computer science at Stanford. He's heading up a research project called 'Who is Zuki?' to find out whether multi-scene digital stories can help wearable engagement. The idea is this: As you hit your goals for the day, a scene of a longer narrative is populated with characters. When you hit your goal for the week, the scene is populated with even more flavour. The next week, you get another chapter in the story. The idea sprang up from Landay's work on Intel's Ubifit wearable about a decade ago. It was a pager-sized step tracker that told users about hitting their goals via connected wallpapers on a Windows Mobile phone. The original idea centered around a garden you would populate with a flower each day you completed a goal. At the end of the week, butterflies would appear if you hit your target. Landay says Intel found people treated these as stories or games, even though they were never designed that way. It turns out that humans are a species obsessed with narratives and stories. We've been doing it since we've been cavemen and women. Landay's team is now on a quest to see how potent this idea can be in the realm of connected tech. Landay's team is also looking into haptics – specifically, how haptic technology can help us in our personal lives via wearables. The idea came about during the team's research into haptic feedback, which looked into scenarios where the tech was valuable. The team found that haptic feedback was too often more confusing than useful. Like how Apple Maps on Apple Watch vibrates differently to tell you which direction to walk in. But they did find that people found value from haptics when sitting at a desk. This lead to the team thinking of a way to use haptic feedback to help people while they're sitting around – the idea they came up with is called microinterventions. Basically, what would happen is that your wearable would be tracking your stress and heart rate while you were sitting down. The wearable would use this data to sense if you were sad or lonely and then give you haptic feedback to draw your attention away from negative emotions. Then, it would recommend an activity to help you while it alerted a close friend or relative, perhaps a spouse or long-distance partner you were missing, so they could get in contact.